Evening time can be a challenge for calorie control! When eating at home, we sometimes find ourselves munching endlessly after dinner. Is there a way to control this? The answer is yes - and tips are below. Eating out can also be a challenge - it can be an enjoyable, yet “dangerous” experience! How can we enjoy ourselves, have fun with friends in a relaxed setting, savor delicious food, but also avoid sabotaging our healthy routine? Can we eat out, without regret? The answer again is yes, especially if we plan ahead a bit, using a few key strategies. Here are ten quick tips to stay in control. Do not “starve yourself” to save calories for dinner - it will backfire. Bring protein snacks with you to work if going out to eat right after work, and consider eating them in the late afternoon on eat-at-home nights. Do not start with bread, butter, or alcohol. Instead have an appetizer with protein and fiber. (Ideas: shrimp cocktail, salad, chicken satay.) If you really crave bread and butter, have it WITH your main meal, not before. Consider having broth-based soup before the meal (not heavy cream soup). Research suggests soup may help you eat less during the meal. Be cautious if you are salt/sodium-sensitive. Some sodium-free or low-sodium brands are Pacific Organic, Trader Joes, and Imagine Organic. If you plan to drink alcohol, eat your protein and fiber first, and sip your alcohol during your meal. Choose your drink carefully, so you do not ruin a full day of calorie control. The above steps will help PORTION CONTROL during your meal. When eating out, consider sharing a meal with your partner (or bring half home), and sharing dessert, as well! When eating at home, serve your portion, then save the rest for lunch tomorrow! Dessert or night snack- use our "remove and replace" strategy, swapping healthier options in, and less healthy out. Some choices for night desserts that are sweet tasting with protein to help fullness: a frozen VHP shake, protein pudding, Enlightened bar, Yasso Bar, berries with whipped topping, or a protein hot chocolate with whipped topping. Our goal is to add fiber without adding too many calories or too many carbohydrates for our needs. Controlling and reducing carbohydrate intake may be beneficial for maintaining blood glucose and insulin levels, particularly in those with prediabetes, diabetes, metabolic syndrome, PCOS, abdominal weight gain, peri-menopausal weight gain, and inflammatory conditions. According to the Institute of Medicine, “The average adult eats around 15g of fiber each day. The general recommendation for daily fiber intake is 25-35g per day; more specifically, women need 25 g/day and men need 38 g/day”. It is important to increase fiber slowly, because adding too much too soon can lead to cramping, constipation, gas, bloating, and discomfort. Gradually introduce additional fiber to the diet over a few weeks to avoid stomach distress. Choose whole fruits and vegetables, instead of juices. Drink plenty of fluids (non-caloric). Set a goal of at least 8 glasses a day to help your body process fiber. Consider adding beano when starting to add non-starchy vegetables (beans, broccoli, cauliflower, greens). Choosing fresh or frozen non-starchy vegetables can help increase your fiber intake while keeping the number of carbs down. One serving of non-starchy vegetables is one cup raw or ½ cup cooked and generally contains up to 5g carbohydrates. Darker colored vegetables have the additional benefit of higher vitamin and antioxidant content. Caution: peas, corn, potatoes, rice, and winter squashes are much higher in carbohydrate and calories. Looking for quick and healthy dinner ideas? You've got it: six minute meals and links to some great healthy recipe websites! You can use these in combination with our new Healthy Weight at Home Program. First, our new plan, then the recipes! Healthy Weight at Home is an easy, delicious, and safe way to achieve your healthy weight, from the convenience of your own home! Since 2004, thousands of patients have lost tens of thousands of pounds at our New Hampshire medical office. Patients have traveled across the country to see Dr. Warren and her team. Now you can join our NEW Healthy Weight at Home Program, and begin your journey without traveling to see us! You will begin with our 4 week kit that includes medically designed food, Dr. Warren's Healthy Weight At Home E-book, an easy to follow support guide, and recipes. We will also provide you with a FREE consult session with one of our supportive lifestyle and nutrition coaches to help you get off to a strong and successful start, and a FREE followup consult to help you stay on track! Our Protein Supplements are delicious, and medically designed to trigger a sense of fullness or "satiety", so you ENJOY your food. They provide you with superior nutrition, while making it simple to control your calorie intake. You'll feel full and satisfied. After you develop a new eating routine, you can transition back to grocery store foods, and we will help you customize a nutrition program. Our initial kit will get you off to a great JUMPSTART. At week 3, we will help you plan ahead for continued success, with our FREE followup consult. You can order our fast track system every two weeks until you reach your healthy weight. We will be with you every step of the way! When you reach your healthy weight goal, you will be ready to start the MAINTENANCE phase of your program.. This is an exciting time, but can also be scary! We will help you as you begin to incorporate more foods from grocery stores, and add variety to your healthy routine. 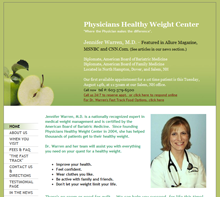 Dr. Warren has developed expert techniques to help people maintain their new healthy lifestyle, and help people overcome challenges. HEALTHY WEIGHT AT HOME IS EASY TO FOLLOW. 3 high protein snacks which includes delicious protein bars, protein hot chocolate and other tasty options, cozy protein soups, our special high protein oatmeal, and more. 2 of our delicious and simple Very High Protein Meal Replacement Shakes - just add water and they are complete meals! Our patients love how delicious and satisfying these are. A healthy and delicious dinner you prepare yourself. We provide simple, easy-to-follow recipes that are high in protein and healthy vegetables, and can be wonderful for the whole family. Today can be the day you start on your healthy journey! We look forward to helping you! Empty your choice of protein into a bowl, and stir in all dry seasonings. Next stir in the cilantro, tomato, and onion. Spoon onto the lettuce leaves, roll up and enjoy! Steam broccoli slaw until tender. Stir in Laughing Cow cheese wedges and sour cream. Microwave until melted, stir, and add in chicken. Season with garlic powder and paprika. Drain tuna and rinse beans. Toss with lettuce, veggies, oil, and vinegar. Ready to eat! Spray microwavable cup with nonstick spray, then add spinach/peppers/mushrooms and microwave until soft (about 1 minute). Pour off or blot excess water. Pour egg whites into cup, stir, and microwave 1 minute. Add Laughing Cow wedge and tomatoes, and microwave 1 minute. Top with cool avocado, and enjoy! Microwave stir fry veggies and broccoli. Add chicken, southwestern sauce, and oil. Mix together, heat, and enjoy! www.Delish.com - recipes and menus - be sure to go to the LOW CALORIE recipe section. www.sparkpeople.com - There is a recipe calculator too! www.fatsecret.com - There are cauliflower ideas and eggplant lasagna!